Can I just tell you that I had a brilliant post written for today? BRILLIANT. And Blogger ate it. As in, it's gone. Completely and totally gone. Forever. For some reason, I can no longer access the ability to view, change, or publish posts from my iPad. (Seriously Google, I hate you. HATE.) I looked at it last night on my iPad. This morning, on my laptop, it's GONE. Super. If you know why the new layout hates iPads, let me know. Also, it allows me to "schedule" posts, but it never actually publishes these posts at the given time. Awhile back, sweet Bethany from Life So Sweet gave me the Liebster blog award. I can't remember if I posted anything about it or not. I think I did, but then I forgot to add the "award" to my site. Now, the lovely lady behind Adventures of E has also sent me the award. When Bethany sent me one, no random facts were "required" by the recipient. When I received it from E, she had posted a few random facts about herself. So, I'm just going to cut to the chase and write up some randomness about myself. Because everyone should know this stuff about me, obvs. Kristin (love that spelling!) 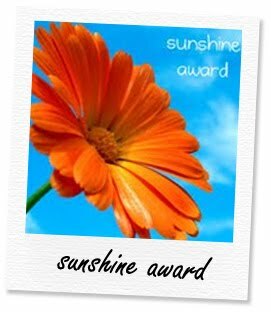 from Live, Laugh, Love sent me the Sunshine Award awhile back also. If anyone deserves an award for being a positive little ray of sunshine, it'd be me. I'm glad she could see that. 1. I am incapable of keeping a tube of toothpaste neat and clean. It always looks like an untrained monkey has been using it. 2. I enjoy tanning. Whether outdoors or in a tanning bed, I always feel better with a tan. 3. I can't use scented soap or bubble bath. I get supreme irritation on the skin. 4. I'm extremely finicky about my wedding/engagement rings. I don't wash dishes, cook, shower, clean, or do any messy/rough task (like cutting the grass) with them on. I hate it when they get dirty so I'm forever cleaning them. 5. I cannot make myself burp. 6. You know how some people say a nap makes them feel better? For me, it's a shower. Showering restores my motivation to succeed at life...and it gets me off the couch. 7. While I love chocolate chip cookies, I don't like raw cookie dough. I will, however, eat brownie batter with a spoon. 8. I can't tie a tie. 9. I don't understand people who say they don't have time to eat or think about food. I think about food all.day.long. People who don't like to eat are boring. 10. I can't stand overhead lighting. The fluorescent variety especially annoys me. This drives my husband insane because he's always saying he can't find anything because he can't "see anything". He's just not trying hard enough. I've adapted the ability to get ready in the dark. 11. I hate jeans. So, so much. 12. I sleep with socks on at least 360 days a year. My feet are always cold. Even in the summer. 13. I don't watch any kind of reality t.v. I could elaborate here, but the bottom line is that I can't stand it. 14. I'm the anti-morning person. I despise saying "Good morning!". It sounds so fake. 15. I've never had a manicure or a pedicure. 16. I buy, maybe, 3 new pairs of shoes a year. The last pair I bought was in September 2011. (Though, sometimes I go flip-flop crazy in the summer.) However, I won't pay more than $50 for a pair of shoes. 17. I hate my toes. I hate painting my toenails, and I hate that a dozen years of soccer has destroyed them. 18. My least favorite animal is the bat. I hope you'll still be my friend. Oh, and I think this is the funniest thing I've ever read. I'm actually considering ordering a stockpile of the Beyonce chicken cards to send to family and friends. They'd all like that, right?? I think about food all the time, too. I'm always working my way to my next meal and usually obsessing over what to make for dinner. I am not a morning person either, and often prefer, "Morning." to the more socially acceptable, "Good Morning." You are so funny! 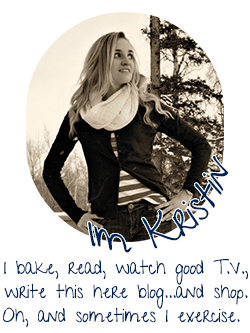 I'm so glad I found your blog, because you always make me laugh. I agree with you about showers. It's so ridiculously hard for me to drag myself out of the shower. I wish I could hug a shower to show it how much I love it...that sounded weird. :) I too sleep with socks on almost every single night, I don't like reality tv, and I've had manicures and pedicures but I don't like them. However, I do like cookie dough and could eat that and brownie batter all day long! 12. Well, you live in the frozen tundra. And, it's the funniest thing I've ever read too. :) And, I really, really, want a set of those towels. I love you but how in the world can you hate jeans?! They're so awesome. I could honestly live in them if I had to. Manicures...I got my first one at the ripe old age of 23 & have never (and will never) get a pedicure. No one touches my feet. Congratulations on your super cute awards hon! OMG, I hate wearing rings because I'm obsessed over how they feel when they're wet or dirty... so gross!! And I have to say I also loathe painting my toenails but I do it anyway because I really hate unpainted toenails, too. Ugh, I'm so annoying. Also, the Bloggess. Funniest. 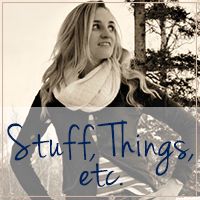 Stuff. Evah. Her book had me crying.